The post on the “wrong” Bernard Dirks who naturalized in Woodford County, Illinois, in November of 1876, led to a discussion of how close the date of this Bernard’s registration was to the election date in 1876. In fact, the naturalization took place on 6 November 1876–the day before the election. Wouldn’t Bernard have to have been on the voter’s rolls earlier than that in order to vote? Not necessarily according to the 1874 Illinois Revised Statutes. Voters not on the rolls the Tuesday preceding the election could vote if they could furnish an affidavit stating their eligibility to vote and get a registered voter and householder within the same district to make an oath that the unregistered voter was in fact eligible to vote in the election. So Behrend Dirks who naturalized in Woodford County, Illinois, on 6 November 1876 could have voted the next day in the general election. I’m even less convinced now that the Bernard Dirks who naturalized in Woodford County, Ilinois, is my Bernard Dirks from Adams County, Illinois. 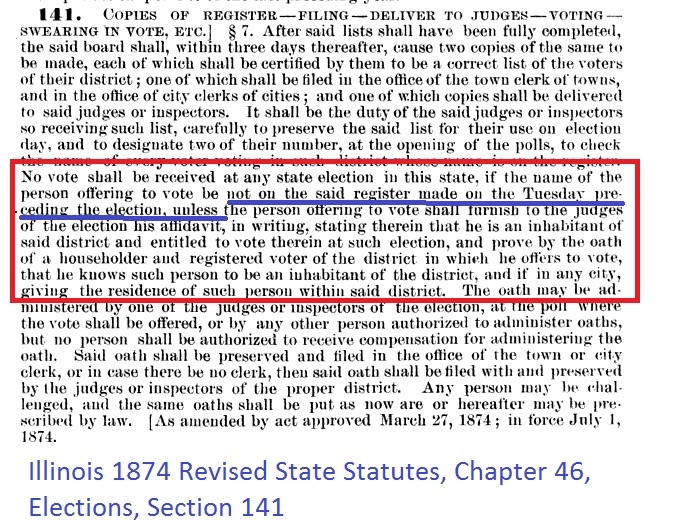 But…the Woodford County Bernard Dirks could vote in the general election of 1876. State statutes answer all kinds of questions.